Кашмі́р (Кашміры: कॅशीर, کٔشِیر; Догры: कश्मीर;Ладакхі: ཀཤམིར; Балці: کشمیر; Гаджры: کشمیر; Пунчы/Чыбхалі: کشمیر; Шына: کشمیر; Уйгурская мова: كەشمىر ; Дэванагары: कश्मीर) — спрэчная вобласьць на паўночным захадзе паўвострава Індастан, гістарычна былое княства ў Гімалаях. Падзел Кашміра не замацаваны афіцыйнымі пагадненьнямі пра граніцы, а сам рэгіён зьяўляецца месцам напружанасьці паміж краінамі, які займаюць яго, першым чынам Індыяй і Пакістанам. Кашмір мяжуе з Афганістанам на поўначы, Сіньцзян-Уйгурскім і Тыбецкім аўтаномнымі раёнамі Кітаю на ўсходзе, штатамі Індыі Хімачал-Прадэш і Панджаб на поўдні і Пакістанам на захадзе. Цяпер Кашмір разьдзельны на індыйскі штат Джаму і Кашмір (уключаючы правінцыю Ладакх) агульнай плошчай 101 387 км² і насельніцтвам 10,1 мільёнаў жыхароў; самаабвешчаную непрызнаную дзяржаву Азад Кашмір («свабодны Кашмір») плошчай 13 000 км² і насельніцтвам 3,6 мільёна жыхароў, кантралюемае Пакістанам; «паўночныя тэрыторыі» плошчай 72 500 км² і насельніцтвам 1 млн жыхароў, якія знаходзяцца пад кантролем Пакістану; і невялікую тэрыторыю пад юрысдыкцыяй Кітаю плошчай 37 555 км² і некалькімі тысячамі жыхароў. Агульная плошча Кашміру складае 222 236 км². Blank, Jonah. 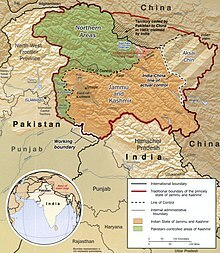 "Kashmir-Fundamentalism Takes Root, " Foreign Affairs, 78,6 (November/December 1999): 36-42. Drew, Federic. 1877. "The Northern Barrier of India: a popular account of the Jammoo and Kashmir Territories with Illustrations; 1st edition: Edward Stanford, London. Reprint: Light & Life Publishers, Jammu. 1971. Evans, Alexander. Why Peace Won’t Come to Kashmir, Current History (Vol 100, No 645) April 2001 p. 170—175. Hussain, Ijaz. 1998. «Kashmir Dispute: An International Law Perspective», National Institute of Pakistan Studies. Irfani, Suroosh, ed «Fifty Years of the Kashmir Dispute»: Based on the proceedings of the International Seminar held at Muzaffarabad, Azad Jammu and Kashmir August 24-25, 1997: University of Azad Jammu and Kashmir, Muzaffarabad, AJK, 1997. Knight, E. F. 1893. Where Three Empires Meet: A Narrative of Recent Travel in: Kashmir, Western Tibet, Gilgit, and the adjoining countries. Longmans, Green, and Co., London. Reprint: Ch’eng Wen Publishing Company, Taipei. 1971. Köchler, Hans. The Kashmir Problem between Law and Realpolitik. Reflections on a Negotiated Settlement. Keynote speech delivered at the «Global Discourse on Kashmir 2008.» European Parliament, Brussels, 1 April 2008. Lamb, Hertingfordbury, UK: Roxford Books,1994, "Kashmir: A Disputed Legacy. Moorcroft, William and Trebeck, George. 1841. Travels in the Himalayan Provinces of Hindustan and the Panjab; in Ladakh and Kashmir, in Peshawar, Kabul, Kunduz, and Bokhara… from 1819 to 1825, Vol. II. Reprint: New Delhi, Sagar Publications, 1971. Neve, Arthur. (Date unknown). The Tourist’s Guide to Kashmir, Ladakh, Skardo &c. 18th Edition. Civil and Military Gazette, Ltd., Lahore. (The date of this edition is unknown — but the 16th edition was published in 1938). Schofield, Victoria. 1996. Kashmir in the Crossfire. London: I B Tauris. Stein, M. Aurel. 1900. Kalhaṇa’s Rājataraṅgiṇī-A Chronicle of the Kings of Kaśmīr, 2 vols. London, A. Constable & Co. Ltd. 1900. Reprint, Delhi, Motilal Banarsidass, 1979. Muhammad Ayub. An Army; Ita Role & Rule (A History of the Pakistan Army from Independence to Kargil 1947—1999) Rosedog Books, Pittsburgh, Pennsylvania USA 2005. ISBN 0-8059-9594-3. Гэтая старонка апошні раз рэдагавалася 9 сакавіка 2019 году ў 11:44.